While HD camcorders stay north of £500 and DVD models offer poor compressed images and other inconveniences for Mac owners, the MiniDV tape format has life left in it. 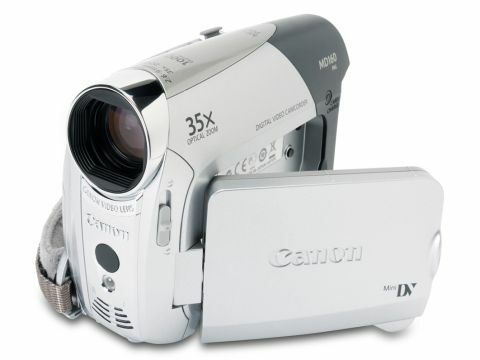 Canon makes good, cheap, reliable MiniDV camcorders and the MD160 continues to help that reputation along. The zoom lens here is particularly good. This pairs nicely with Canon's anti-shake software. Together they give the footage a crisp edge at fairly extreme zoom lengths. Things only started to wobble for us right at the end of the 35x optical zoom range. Panning in and out of subjects is smooth too. We tracked skaters in the park and it was easy to keep them in the frame, and the composition was reasonably shake free. The button layout is also a doddle to master, which makes it a good family choice. The fold-out colour LCD screen is also good quality and gave us a decent frame to compose the shot, even in broad daylight. A handy toggle button takes you smoothly through the simple menu system. The microphone works well, but also picks up the whirring of the tape, which you can hear at quiet moments during playback. There's no external mic port on this camcorder, which is a shame, and no shoe for accessories either. There's a tripod screw but it's made out of plastic - some corners have perhaps been cut to make the price. Still images are of reasonable quality, but don't expect it to replace your stills camera. There's an SD card slot and a button to switch it to memory instead of the tape. Light and colour capture is generally okay, but can be poor at the very high-end of the spectrum. Sunlight can be noisily represented and bleeds into the surrounding areas. Overall, there's a lot of good in this camera and at this price we recommend it, but do also consider equivalent models, such as the JVC GR-DF470EK.